The Prime Minister, Peter O’Neill , has welcomed the ongoing engagement between Papua New Guinea and the Export-Import Bank of China to fund development projects around the country. 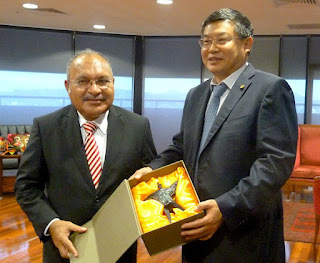 PM O’Neill made the comments after meeting EXIM Bank Vice President, Mr. Sun Ping, in Port Moresby last week. “China is a strong development partner with Papua New Guinea and we look forward to developing additional projects,” the Prime Minister said. “We have a very clear one-China policy in Papua New Guinea and work together on a range of projects and initiatives that deliver clear benefits for our country and the broader global economy. “This includes infrastructure delivery, and interests of mutual benefit such as dealing with climate change. “With the recent re-election of Xi Jinping as the President of the People’s Republic of China, and the continuation of China’s development programs, I anticipate we will identify additional opportunities to increase engagement. “EXIM Bank Vice President Sun Ping was in Papua New Guinea to research projects and work with the Government on a number of opportunities ahead of the APEC Leader’s Summit in November. The Prime Minister further welcomed the intended visit by President Xi to Papua New Guinea during APEC Leader’s Week. “China is providing support for APEC 2018 Papua New Guinea and we look forward to hosting President Xi in November. “Both countries are looking to the delivery of concrete outcomes from the current APEC year hosted by Papua New Guinea. “The policy agenda of APEC this year has a strong focus on economic empowerment and this is particularly relevant to Papua New Guinea as we continue to expand infrastructure across the country. President Xi Jinping has confirmed his attendance at the APEC Summit and this will also provide the opportunity for him to see first-hand a number of development projects undertaken in Papua New Guinea with China.